Hair dryers aren't usually a hair tool that I get excited about as they tend to be pretty standard and all do the same job! However, the new Babyliss Pro ItaliaBRAVA* is a different story - it has totally blown me away! I was very kindly sent this as a surprise from Feel Unique and as soon as I opened the sleek black box it came presented in, I was highly impressed with the way it looked. It's a very chic looking black hair dryer with the Babyliss logo on the side as well as the heat and speed settings on the handle. When I removed the hair dryer from the box, I couldn't believe how light it was. Before receiving this I'd been using a hair dryer that was so heavy my arm would start to ache halfway through drying my hair so the fact that this one is so light is a big big big bonus for me! 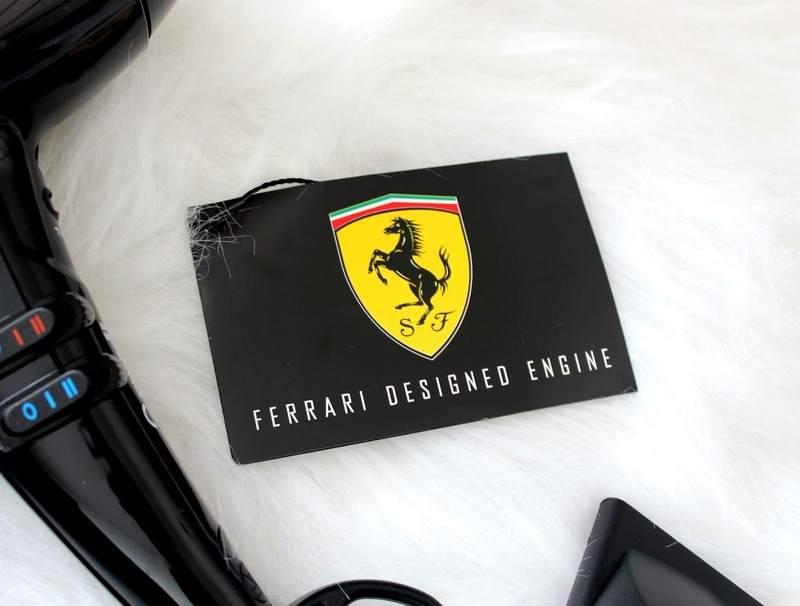 I also noticed a little card in the box that said 'Ferrari designed engine' and that had me instantly intrigued. 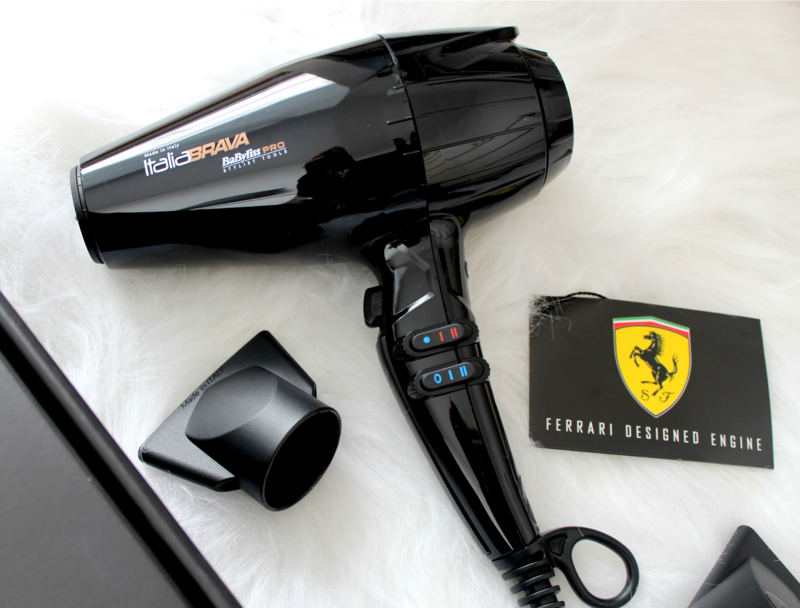 A hair dryer designed by Ferrari - surely not right?! Well actually, that's exactly right. 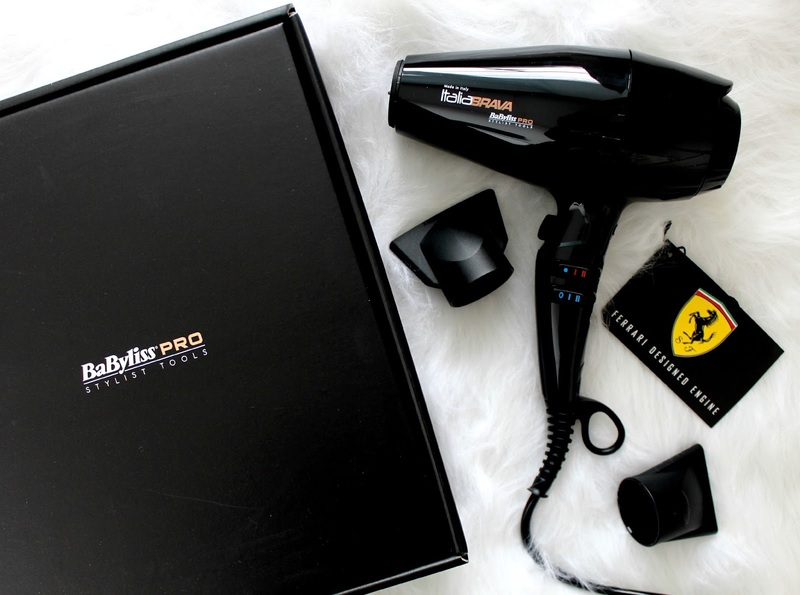 Babyliss have partnered up with Ferrari to create the ItaliaBrava. No wonder it's so blooming good! The main reason I love this hair dryer so much is because it's super powerful. I've got pretty long hair so it can take what feels like a lifetime to dry it if I'm using a bog standard hair dryer (like to ones you get in hotel rooms for instance - not great) but this one is so powerful that it drastically reduces the amount of time I have to spend drying my hair. An extra 10 minutes in bed in the mornings?! Yes please. In all seriousness though, it's actually made a massive difference to my morning routine. The reason it's so powerful is because it has a 'fierce brushless motor' with a power of 2400w which lasts up to ten times longer than a normal motor. Babyliss say "the grille provides hair with a superior heat transfer whilst the ionic generator can be used to boost hair´s shine." It also has a 15% faster airflow and stronger air pressure than other Babyliss dryers as well as 12 heat/speed settings so it can be used exactly as you want it. My favourite setting would have to be the 'turbo' button which can be found on the back of the handle - just like a Ferrari, pressing this button really revs up the 'engine' of the dryer and gives you even more power and quicker drying time. It also has a cold shot button so you can lock your style in place and create shine as well as two nozzles which allow you to concentrate the airflow and create your preferred hair style. Another bonus of the ItaliaBrava is its 'Nano Titanium heat technology' which is said to be an excellent heat conductor and instead of drying the hair out, it helps to lock in its natural moisture. This is great news if you need to blow dry your hair a lot as we all know how damaging heat can be for the hair. I've actually noticed a big difference in the condition of my hair since I started using this hair dryer - it's a lot softer than it was a few months ago and it always looks healthy and shiny after blow drying instead of dry and frizzy like it once did. You can get the Babyliss ItaliaBrava here for £120.00 and although it is quite expensive, I'd say it's an investment worth making as it's a truly high class hair dryer and will be sure to blow the one you're currently using right out of the water. Plus, who doesn't want quicker drying time, less heat damage and a lightweight hair dryer that won't leave your arm achey after 5 minutes? Feel Unique often off site wide discount codes too so keep your eye out for one of those! Do you like the sound of this hair dryer?! This does sound amazing, I really want to try it out now! Omg this sounds amazing!! I use to blow out my hair all the time but it would always take me forever!! This sounds like the solution to that problem, especially the turbo setting!! This sounds like an amazing dryer. To bad I can't use this to straighten my hair, because it's curly. This sounds so good. I picked up a Babyliss Diamond hairdryer when it was on sale at christmas and it's the best hairdryer I've had. They've definitely come along way since I was a kid! So good that the hairdryer is lightweight. I also find my arm starts to ache with some heavier machines and it makes blow drying so uncomfortable. This hairdryer sounds super impressive, the design is very pretty too! I love the sound of this, and I really want to try it now! This looks so amazing! I neeeeeed this in my life! thats quite expensive but if you think about it, quality is the key. Babyliss always wins it for me, and I'm in desperate need for a light dryer!